Immune cell memory is a critical line of defense for the body against repeat infections. Yet, for all their importance, the origins of memory T cells have remained a mystery. Now, investigators from The Scripps Research Institute's Florida campus may have just uncovered the origins of immune cell memory. They found that a transcription factor protein called Runx3 puts dividing T cells on track to becoming memory T cells. Findings from the new study—published recently in Immunity (“The Transcription Factor Runx3 Establishes Chromatin Accessibility of cis-Regulatory Landscapes That Drive Memory Cytotoxic T Lymphocyte Formation”)—could allow researchers to design drugs that improve immune responses to vaccines. Additionally, this discovery may also have even broader implications for chronic diseases, such as cancer, in which responding T cells sometimes become “exhausted” and unable to rally an effective defense. Runx3's control of T-cell differentiation is important because when our bodies fight off viruses and cancers—and our T cells burst into action—the vast majority tend to become effector cells. These effector cells are short-lived and do not persist once the infection resolves. In the current study, the research team found that the amount of Runx3 has a direct effect on the outcome of the differentiation of the T cells. Runx3 controls that burst of activity and ensures the cells are directed toward a different fate, that of memory T cells, which can live for decades. “This finding provides molecular evidence that the programming of memory is established very rapidly, and that it's kind of a push and pull to restrain the developing memory cells from differentiating into effector cells, which is a dead-end road,” Dr. Pipkin remarked. The researchers also studied what happened when Runx3 expression was partially suppressed using RNA interference. “All those experiments showed you lost the known precursors that give rise to memory T cells,” Dr. Pipkin noted. Conversely, cells with experimentally increased Runx3 produced more memory T cells. Interestingly, cells with increased Runx3 were also better at regenerating new rounds of memory cells than normal cells after repeated infections with lymphocytic choriomeningitis virus (LCMV) and Listeria monocytogenes. This indicated that Runx3 enhances memory T-cell potential. This new study also sheds light on the timeline when immune memory is established against a foreign antigen. The researchers found molecular evidence that the programming of memory T cells happens very rapidly after the immune system first encounters new threats. At this time, naïve CD8+ T cells must begin developing into specialists called cytotoxic T lymphocytes (CTL), which can kill infected or malignant cells. 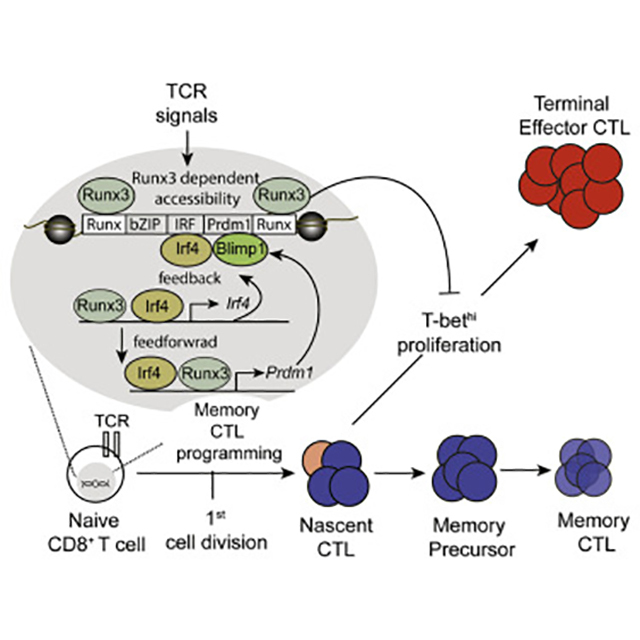 Dr. Pipkin's team found that Runx3 coordinates the memory T-cell differentiation program within the first few hours of infection. Moreover, the researchers found the critical role of Runx3 in T-cell differentiation by challenging naïve T cells with an antibody signal that mimicked infection and then mapping the areas of the newly exposed genome. This revealed that the locations on our chromosomes where Runx3 binds became receptive to binding immediately after infection, and before the first CD8+ T-cell division. These regions were also receptive to fully developed memory T cells, but less so in the terminal effector cells. “We know that Runx3 is working with a number of additional transcription factors and chromatin regulatory proteins. So, we are currently trying to identify them and determine how they collaborate with Runx3 to turn on and off different regions of the genome to promote memory development,” Dr. Pipkin concluded.